The principal investigator manages the award as outlined by the scope and defined by the budget. When authorizing expenditures, the PI certifies expenses are reasonable, allowable under the order of precedence, and allocable to the research project's scope of work. 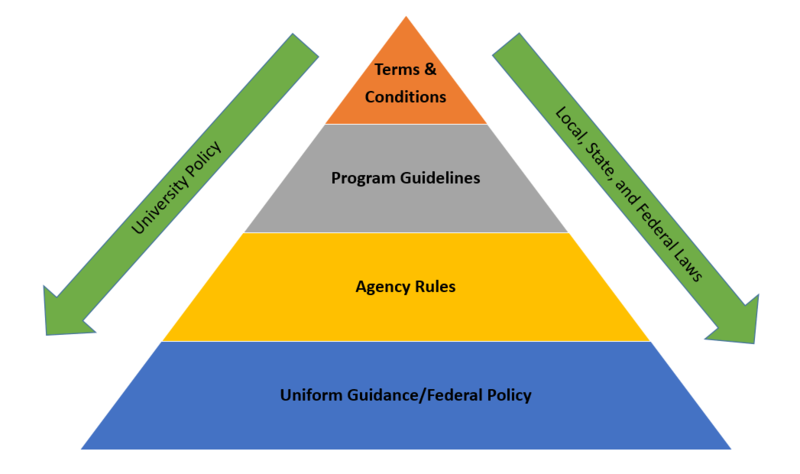 As the Uniform Guidance flows down through agencies, differing interpretations can arise. The order of precedence helps principal investigators and research administrators know which rules to follow. Always abide by the terms & conditions of the award. They legally bind the sponsoring agency with the university. If you budgeted for resources outside the university (e.g. independent contractors), work with your grant officer and the UNCW Purchasing Office to begin your procurement documents. When acquiring goods and services of $5,000 or more, the Purchasing Office assists in identifying potential vendors, establishing requirements, and managing the open bid process. They are the procurement signatory authority for the university and will help you comply with state acquisition regulations. The university offers ways to find, recruit and hire students on your project. Human Resources can assist in determining the classification and pay scale of grant employees. They also identify benefits applicable to a specific class of employee and provide approval for hiring actions. All employment actions must be consistent with university and state personnel policies. UNCW's financial accounting software Banner shows the available balance and financial history of an award. Faculty and staff can learn more about Banner navigation by attending UNCW's finance training classes. The following table shows the Banner Admin Pages most frequented by research administrators. This report runs daily and can be used to get an up-to-date balance for any budget pool on any grant. Information displayed is as of the date and time of the report. This report runs monthly after each month-end close process. Log into ePrint using your UNCW username and password. Click Next until the desired report is listed. Click PDF icon on the left to open the report. You must have Banner Finance access in order to access ePrint reports. Between the beginning and end of a project, the sponsor may require a programmatic report and/or a financial report. If so, the principal investigator is responsible for providing the programmatic report. UNCW's Grant Billing Office will complete the financial report. If you are submitting a programmatic report, please be sure to copy your grant officer. Depending on the terms & conditions of the award, the sponsor may have the right to refuse payment if required reports have not been received. My grant is ending, what do I need to do? The terms award, grant, contract, and cooperative agreement are used interchangeably throughout this site. If you would like definitions as defined by the Uniform Guidance, visit the Award Management homepage. Below are links to resources to help you with award management.